Pancake feasts on rainy days were family tradition where I grew up in the Freestate. It never rained enough for us to get bored with pancakes and to this day, I rush to get out my mom’s pancake recipe at the very first drops of rain. We have been blessed with some good rainfalls countrywide in recent weeks, and today even the parched Cape Town got a decent downpour. So, pancakes it is! I’m delighted to share with you this wonderful recipe and photo. It comes from the Cape Winelands Cuisine Cookbook published by La Motte Wine Estate, with exquisite food styling by Jacques Erasmus and photography by maestro Mickey Hoyle. Sold at the Farm Shop on La Motte Wine Estate for only R395, it’s a collector’s piece to treasure for a lifetime. The book contains more than 200 recipes exploring the historic roots of the regional cooking known as Cape Wineands Cuisine. Research and development were done by food historian Hetta Terblanche-Van Deventer, who is the Food Director at La Motte. This recipe from the book gets a sumptuous sauce made from Van Der Hum liqueur but I like my pancakes straight up with just a generous dusting of cinnamon sugar! Pancakes are still one of the favourite traditional desserts. At school fêtes, street markets, public gatherings and sport events, the familiar sweet cinnamon smell of freshly cooked pancakes will lure you to the pancake stall, and many people take out the pancake pan at the first sign of the winter chills and rainy weather. 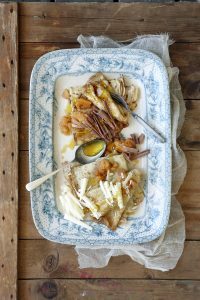 During Jan van Riebeeck’s time, sweet and savoury pancakes were popular dishes in the Netherlands. The old recipes instructed that spices such as cloves, nutmeg and mace be included in the dough and only sugar be sprinkled over the baked pancakes. By the twentieth century, the only flavouring used was cinnamon sugar, sprinkled before serving. Small, paper-thin pancakes were also prepared at the Cape, as in France, but where the French used only a little sauce over their pancakes, at the Cape they were served drenched in sauce. The sauce for the pancakes usually contained sugar, wine, cream and spices, but Van der Hum Liqueur, made from brandy, was a favoured ingredient. Sift the flour and salt in a mixing bowl. Mix into a soft dough with the beaten eggs and small amounts of water or milk at a time. Add the rest of the water and beat briskly. Add the oil or melted butter and allow to stand for 1 hour. When ready to cook, drop spoonfuls of batter into a hot greased pan. Cook until bubbles form the surface, then turn and cook the other side. Roll up or fold into triangles and serve with slices of lemon and cinnamon sugar, or with Van der Hum Sauce and chocolate curls. Pour the water into a saucepan over high heat. Add the sugar and stir until it dissolves. Add the zest and cloves and reduce to two-thirds. Add the van der Hum liqueur, sherry and cream and pour the hot sauce over the pancakes just before serving.